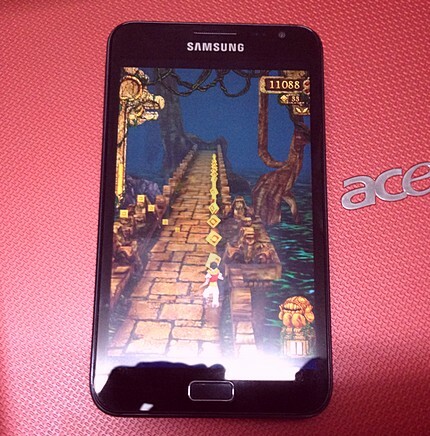 Temple Run for Android Phones and Tablets : In the Works! Coming Soon! One of the best and most famous games for the iOS platform, Temple Run, will make its way to Android OS pretty soon! Great news! Imangi Studios - via its PR agency Triplepoint - has just released an official statement that Temple Run will be released for Android devices on March 27th as a FREE Application! Let your friends know! For the rather uncool ones who aren't even familiar with the game, Temple Run centers around Guy Dangerous and other explorers who entered an ancient temple to steal an idol not knowing that the place is filled with man-eating demonic monkeys that will pursue them, thus starting the "run." [...] [A]nything on Android claiming to be Temple Run is a SCAM. When the real Temple Run is out, you guys will be the first to know! Do you also play Temple Run, TP Friends? What's the highest score you got?